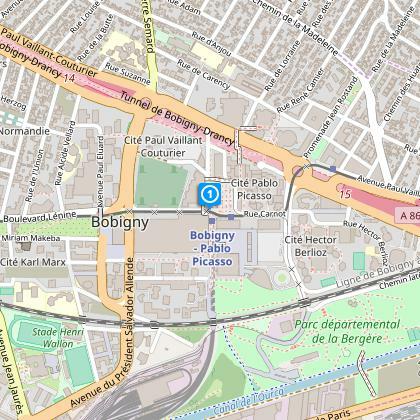 Discover Bobigny town, Seine-Saint-Denis Police Prefecture and the Departmental Board Headquarters, on the occasion of this somewhat surprising urban walking tour. 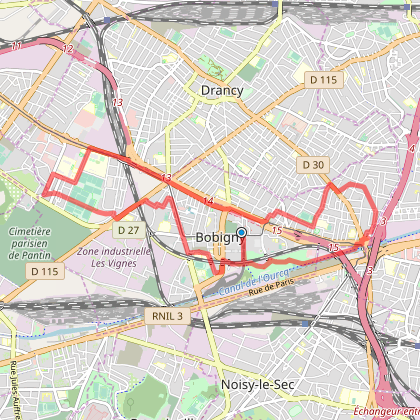 Start from the Police Prefecture and pass in front of the Sikh Temple, Avicenne hospital, the Courthouse, Jacques Brel swimming pool and a district called Edouard Vaillant. A walk through the Parc de la Bergère will take you back to your starting point..
Start from metro or T1 tramway station Pablo-Picasso, cross the boulevard and take the street "rue du Chemin Vert" and "rue Jean de la Fontaine", pass over the SNCF line, turn right onto chemin and "rue des Coquetiers", turn left onto "avenue du Président Salvador Allende", turn right onto "Rue Jacques Anquetil", turn right again onto "rue Bernard Birsenger", turn left onto "rue Karl Marx" and follow the road opposite until you reach "avenue Jean Jaurès". 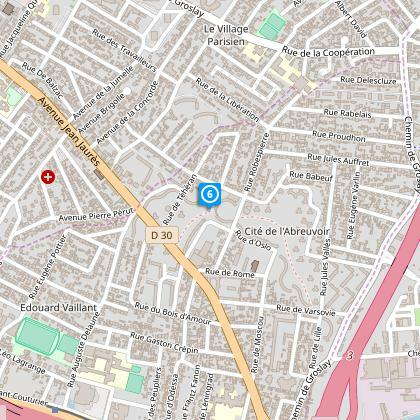 The steps "Rue de la Purée"
Turn right on "avenue Jean Jaurès", go straight on until "rue de la Gaieté", turn left and left again onto "rue de la Ferme", turn right onto "rue du 8 mai 1945", turn left onto "rue du Pré Souverain", turn right onto "rue Garnieri", turn left onto "rue de la Purée" and take the steps. 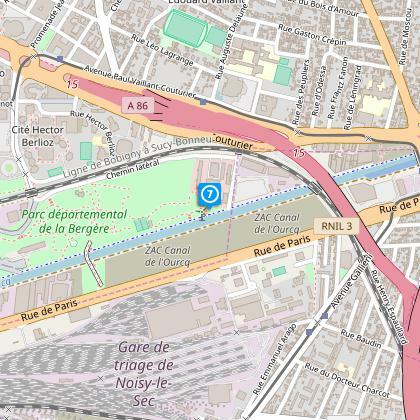 To get to "Promenade Django Reinhardt"
Turn left on "avenue Henri-Barbusse", turn right on "rue Abbé Pierre", "rue de l’Étoil"e, follow "Promenade Django Reinhardt" on your left as far as "rue Racine". 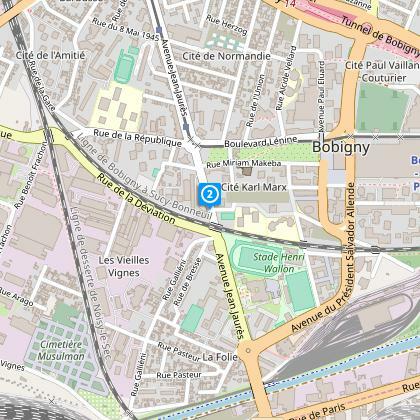 To get to "Promenade Jean Rostand"
Turn right onto "rue Racine", and right again onto "rue Balzac et Chablis", turn left onto "rue Marcel Cachin", take the « green belt » on your right, avenues : "Stalingrad", "Paul Vaillant Couturier", mail "François Mitterrand", and after the Courthouse turn left and follow "promenade Jean Rostand". 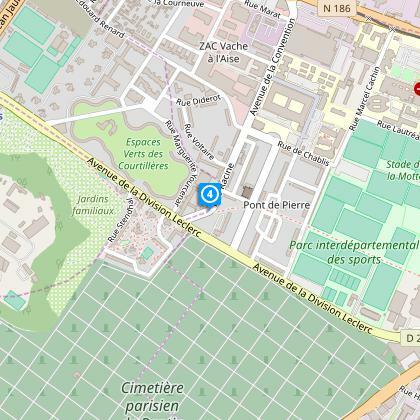 Walk along the promenade, turn right onto "rue Sigmund Freud", and cross opposite to "rue Léo Lagrange", turn left onto "rue Auguste Delaune", right onto "rue Édouard Vaillant", turn left onto "mail de la Cité de l'Abreuvoir". 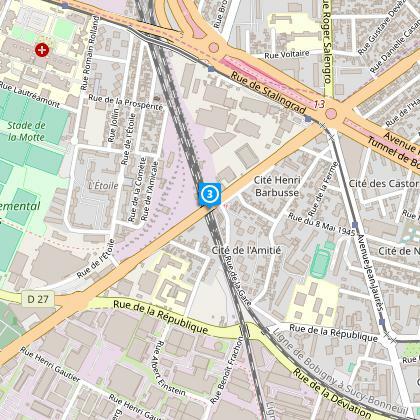 Cross over "place des Nations Unies" and follow "mail de la Cité de l'Abreuvoir" until you get to "rue de Varsovie". 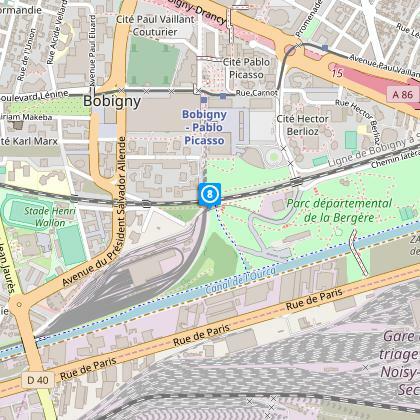 Take the road opposite "rue de Lille", "Chemin de Groslay", bypass "place Saint-Just" direction "Pont de Bondy", before the bridge , take the right turn going down and follow the path on your left that takes you to the canal. Turn right at the canal to "Parc de la Bergère". Cross "Parc de la Bergère"
Go into "Parc de la Bergère" and cross through it from your left ( follow the yellow markings), exit onto "rue Jean de la Fontaine". To get to metro Pablo-Picasso, starting point. 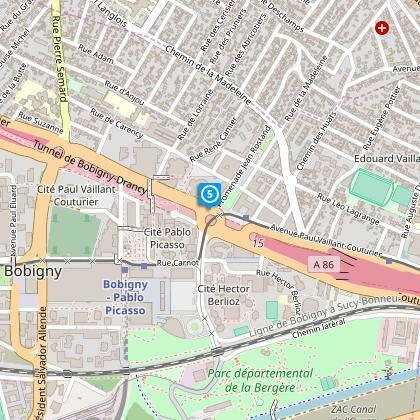 Go right onto "rue Jean de la Fontaine" to get back to your starting point at metro or T1 tramway station Pablo-Picasso.